On my card I used a cutie image, called Easter Bonnet, from our ex-sponsor, Stitchy Bear, and colored it with ProMarkers. Harlequin paper is a digital one from Shabby Princess and the smaller piece with teared ends I grabbed from my box of stashed scraps. 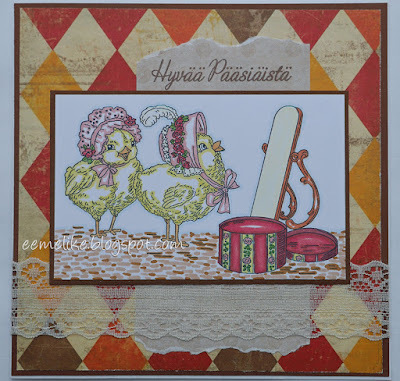 Finnish sentiment is wishing "Happy Easter" and for finishing touch I used lace (new purchase). Kortissani käytin entisen sponsorimme Stitchy Bearin digileimaa nimeltään Easter Bonnet, ja kuvan väritin promarkereilla. 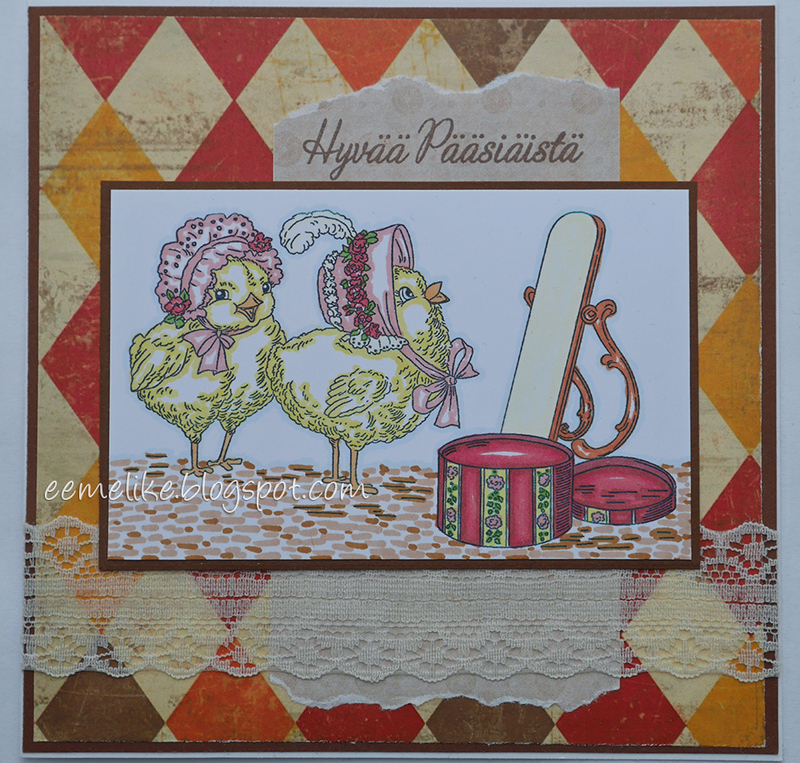 Salmiakkikuosinen paperi on Shabby Princessin digipaperi ja pienempi palanen (kera revittyjen päätyjen) löytö silppulaatikosta. Leimattu pääsiäistoivotus (ei tietoa leimasimen valmistajasta) ja pitsi (uusi ostos) viimeistelevät tuotoksen. How sweet - love those preening little chicks! So glad to see your link for my Easter/Spring challenge! A super Easter creation with such a sweet image with the chicks in the bonnets Eemeli, many thanks for joining us at Allsorts challenge this week. Ui kun hauska ja fiini kortti! Kiitos kun tulit mukaan Allsorts haasteeseen. What a precious image ... wonderful design! Thanks so much for joining in the fun at our Double D ‘EASTER’ Challenge! We hope you’ll come back often. Great card and such a fun image - really made me smile! Such a pretty card and adorable image!! thank you for joining our Double D 'Easter' challenge! What a sweet image. Love your adorable card. Thanks for joining us at Passion For Promarkers this week.